Spinach artichoke pizza is absolutely delicious. Put it on a an easy keto fathead pizza crust and you have a fabulous low carb meal. Low carb and Keto diets are very popular this year. If you haven’t tried a fathead pizza crust you’re in for a treat. 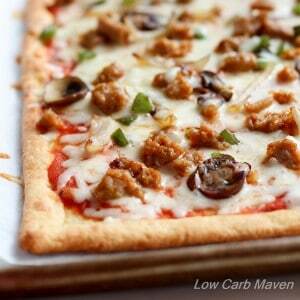 This easy low carb pizza crust can be made in minutes. We have Keto pizza a few times a month and I am always looking for new ingredient combinations with which to dazzle my family. Putting spinach artichoke dip on my pizza was genius! If you saw the steak and shrimp dinner I posted for Valentine’s Day, then you’ll remember I served spinach artichoke dip on the side. It was a great counterpoint to the meal. 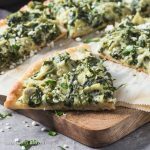 With the leftover dip, I made this great spinach artichoke pizza! I have a more complicated recipe for spinach artichoke dip with feta cheese on the site. It’s one of the best tasting dips I’ve ever had! 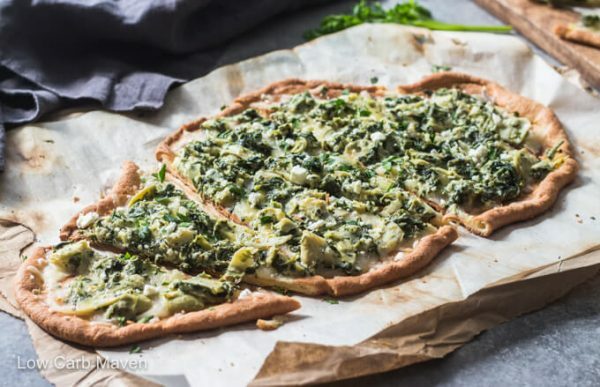 But, this particular recipe is much easier and tastes spectacular on a keto pizza crust. We’ve enjoyed this both as an appetizer and as dinner served with a salad. What I like about this easy recipe is that I can use cold leftover dip from the fridge so the whole recipe comes together really fast. Each serving of this delicious pizza is 5 net carbs. Microwave the mozzarella cheese and cream cheese, 30 seconds at a time, until completely melted, stirring between reheating. Add the egg and mix until incorporated. Add the almond flour and protein powder (if using) and mix until mixed thoroughly. Roll out the dough between two pieces of parchment paper or pat out with oiled hands. The dough is very sticky, but easier to handle the cooler it is. Place on a standard size sheet pan and cook for 12-15 minutes or until browned. Melt the butter with the onions and garlic in a non-stick pan over medium heat. When softened, add the cheeses melt. Add the spinach and artichokes, stirring until well combined. Stir in the red wine vinegar and pepper. Taste and adjust for seasoning. Divide the spread in half (were only using half) and stir 1 tbsp of mayonnaise into the half being used. Refrigerate the extra dip and use as a side or stuff into chicken. Distribute the remaining 1/2 cup of Monterey Jack cheese over the crust. 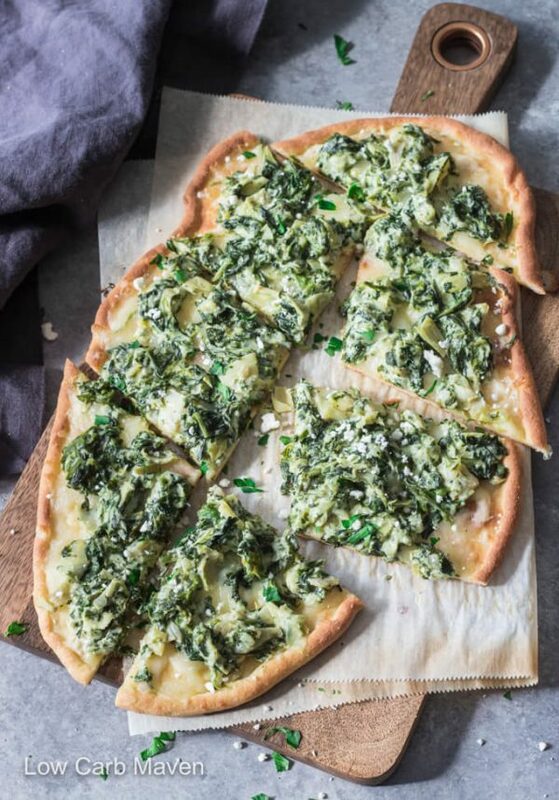 Spread the spinach artichoke dip over the pizza crust and return to the oven until warmed through. Serves 4. The spinach artichoke dip can be made several days ahead. Warm in the microwave before adding to the pizza. I thought the end of the world had come, when I learned my insulin levels were cause of weight gain and health issues. I love food, love to cook, love to bake. Now that I found your low carb site today, I can eat some of the things I so loved, breads, pizzas, cakes and things. You are a treasure. Thank you for this site. You have saved my life and possibly my grown children’s lives..
Is the 8 carbs for the whole pizza or for a quarter of it? Is there a way to make the dough with a flour not made of nuts? My family has severe tree nut and peanut/legume allergies, so we can’t do almond flour. Would love if there were an alternative! Is it possible to freeze the dough? If so, is there anything special that needs to be done to it once it thaws? Thanks in advance ! Fathead crust is my favorite. I love spiach and artichoke dip, so I know I’ll love it on pizza too. Thanks for the recipe! This looks amazing! I am so excited to try this.